Peter Graham is among Australia’s outstanding combat sports athletes. He has reached the highest echelons of competition in full-contact karate, K1 kickboxing and mixed martial arts. Most recently, he became the World Boxing Federation’s World Heavyweight Boxing Champion. I met Jarrod five years ago. I was cornering his opponent that night – Jarrod knocked him straight out with an awesome head kick. He has written a number of magazine articles about me since and I invited him to train and travel with me last year. 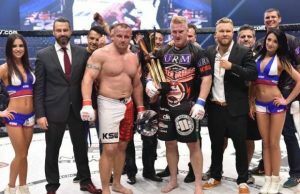 He accompanied me to Poland as a sparring partner and pad holder, where I fought on the biggest cage show in Europe, KSW. 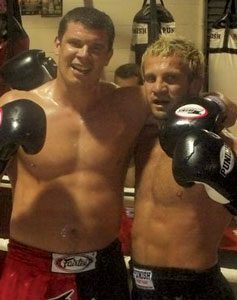 He was also my corner-man in the UK when I fought there on a KSW show six months later. I enjoy training with him. There’s nothing like training with someone who knows [the sport] from both inside and outside the ring – he knows it from a technical standpoint as well. I also like training with him because he’s big! The pad sessions at my gym in Sydney were some of the best pad-holding sessions I’ve had in twenty years of over one-hundred fights across the disciplines of boxing, kick boxing and mixed martial arts. Richard Walsh, head-trainer at Urban Fight Gym on the Gold Coast, Queensland, is one of Australia’s best Muay Thai trainers. The most famous of his charges was Nathan ‘Carnage’ Corbett, holder of world Muay Thai championship titles at 79, 83 and 86 kilograms. Jarrod came to the gym to do a story on my number-one fighter at that time, Nathan ‘Carnage’ Corbett. Nathan held multiple world titles – at 79, 83 and 86 kilos – and struggled to maintain sparring partners. Jarrod did some training and after watching him hit the bag, we invited him to spar with Nathan. He was quick to learn – most of all because he listened! We invited him back to become a regular sparring partner. He also wrote a couple of good articles about Nathan, too. Tim Boyle played AFL football for Hawthorn and now writes a sports column published in The Age Newspaper that is syndicated nationwide. As a former professional athlete, I wouldn’t pay to be trained by someone who’s never done anything serious, or taken any risks, to better understand their own physical limits. Jarrod’s time in combat sports is a very serious thing, and it’s given him an authority of experience that he transfers to clients with confidence. With Jarrod, the physical realities of martial arts are complimented by his intelligence, and clear ideas about well-being. He is adept at challenging a person of any fitness level to focus and improve. He’ll be patient, but also tell you when it’s time to get better. That’s exactly what you need in a trainer. 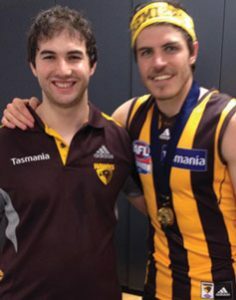 Dr. Daniel Gaitz is a Sports Osteopath, formerly employed at the Hawthorn Football Club, who now works at the East St. Kilda Spinal Clinic. As an Osteopath, I am usually quite reserved when referring my patients to a Personal Trainer. After training with Jarrod, I would happily recommend him to anyone. 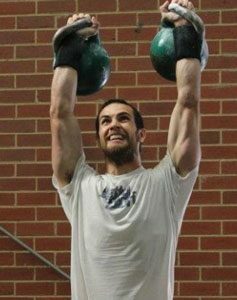 With years of experience under his belt, Jarrod’s knowledge of strength and conditioning goes above and beyond a typical PT. As well as being an exceptional fitness trainer, Jarrod’s kickboxing skills are what set him apart from the rest. Having been a fighter himself, his attention to detail is exceptional. I can honestly say that I’ve learnt more from ten sessions with Jarrod than I did from five years of kickboxing classes. James Ross is the owner of ‘The Richmond Gym.’ He holds a Masters of Exercise Science and is currently pursuing a second Masters degree in Exercise Science through research. His work in these fields has led him to work with world champions in Kettlebell sport, as well as mixed martial arts, Brazilian Jiu Jitsu and submission wrestling. He holds the prestigious rank of Master of Sport in international Kettlebell competition. He has written manuals and taught courses in various aspects of exercise and training techniques. I worked with Jarrod at Iron Edge. I was involved in up-skilling him to become a Kettlebell instructor for the personal trainer’s accreditation course that I taught there. We also co-wrote a manual on training with the Aqua Bag, a piece of equipment unique to Iron Edge. When I became aware of his background as a kickboxer, I decided to do some training with him. Ten years experience as a researcher and strength-and-conditioning coach has given me the ability to recognize good coaches. Jarrod brings a wealth of experience and knowledge, and is very articulate. This combination will help his clients gain a deeper understanding into why they do what they do.